I’ve always been rather skeptical about treating lavender as an edible. Sure, it’s a relaxing and wonderful scent in bath products, perfumes and sachets, and it’s just lovely when growing outside. But it’s taken me awhile to enjoy it in the kitchen. I’ve learned to use it in recipes where the flavors dilute through evaporation, such as biscotti — and most of all, I’ve learned to only use a small amount at a time. (The first time I used it, I heaped a big spoonful into shortbread dough; I renamed the result “soapbread” and tossed the whole batch.) The thing is, I still love the idea of using it in baking. Its delicate herbal taste and breathtaking color are truly inviting and seem to fit well into many desserts. 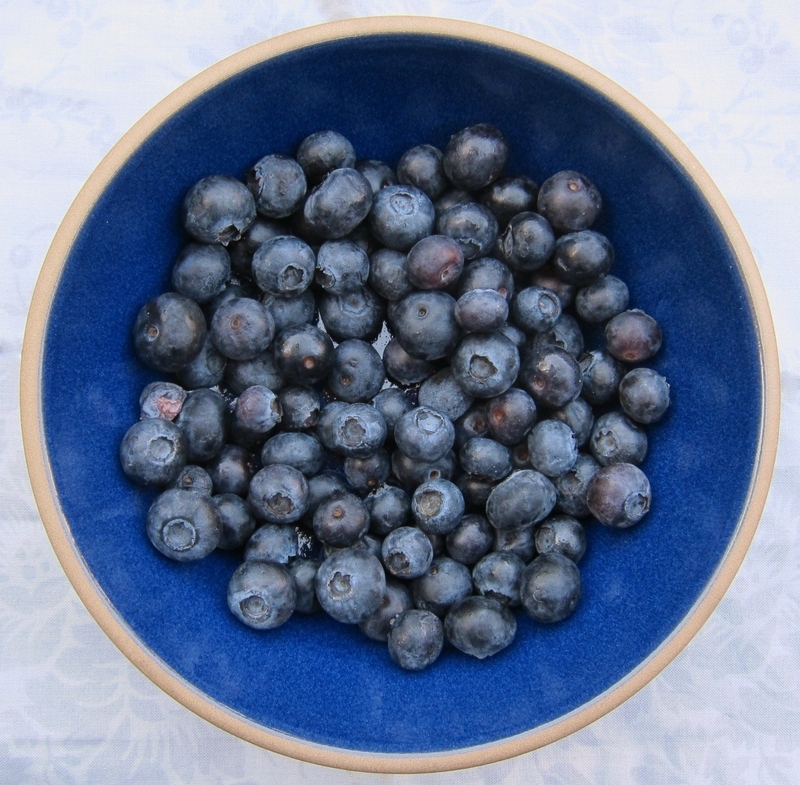 When I ended up with leftover blueberry juice recently, I started daydreaming about the blueish-purple batter I could create, and about all the ingredients of related colors that would complement the tangy blueberry base. 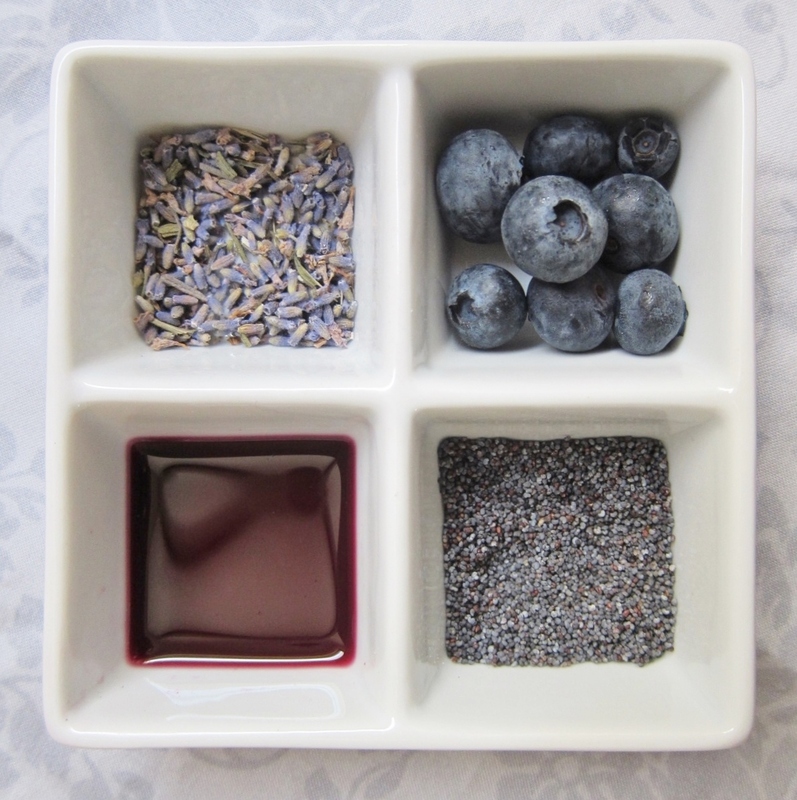 A bit of beautiful lavender was the first to come to mind, followed by indigo poppy seeds with their tiny bits of crunch and unique flavor. 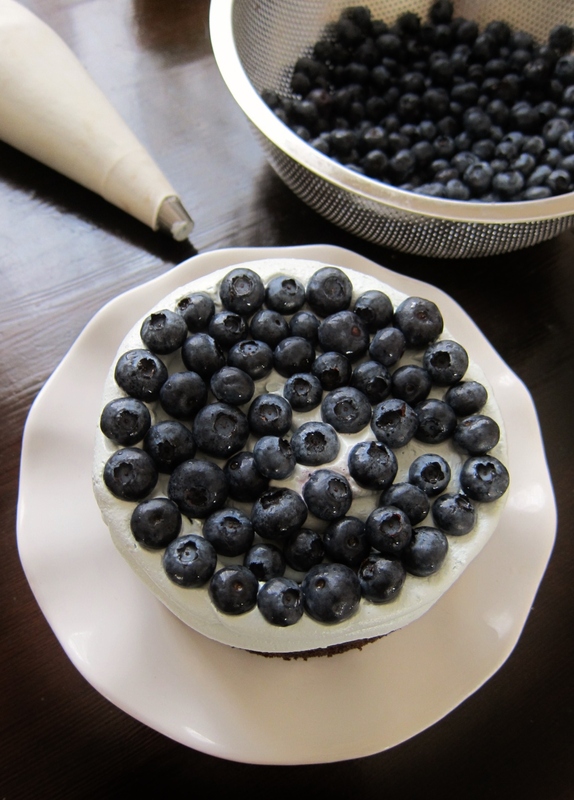 Naturally, fresh blueberries would have to be included — and with the moist, tender cake that resulted, fluffy meringue frosting would be a perfect match. Despite its fabulous, fancy flavors, this recipe is quite quick and easy; the batter can be made in one bowl without using an electric mixer. Here are the details. Preheat oven to 350 F. Line the bottoms of two 6” cake pans with parchment; grease the parchment and inner sides of the pans. Use a mortar and pestle to gently crush the lavender; this will soften its texture and bring out its flavor. Measure out 3/4 teaspoon after crushing, and set it aside. In a large bowl, beat the oil and sugar, then mix in the egg until smooth. Add the vanilla and blend it evenly into the batter. Sift over the bowl: flour, baking soda, baking powder, and salt. Begin mixing while gradually adding the juice. Beat well, until smooth, scraping bowl well and often. 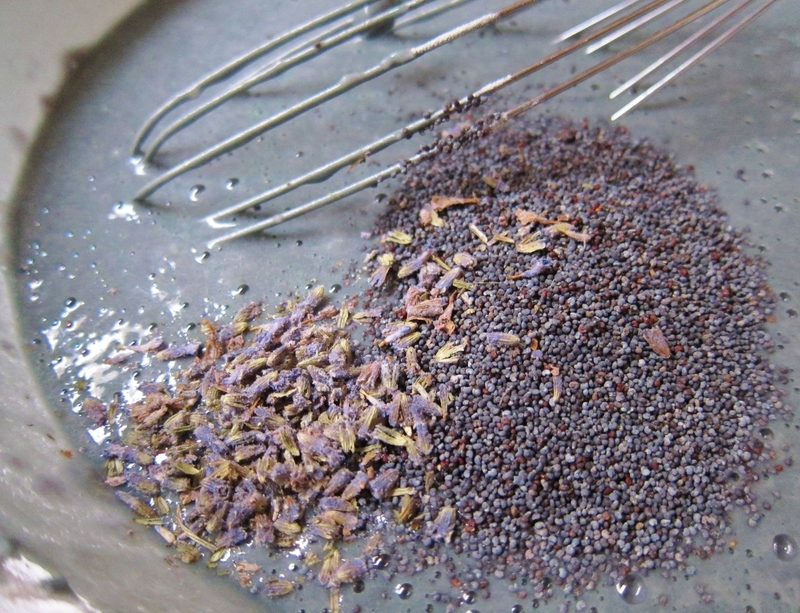 Fold in the lavender and the poppy seeds until evenly distributed. Pour matching amounts of batter into each cake pan, and bake for 25-35 minutes or until a toothpick inserted in the center comes out clean. (Don’t be alarmed if the center oozes blue juices just before the end of baking time; it will stop before it’s done.) Let cake cool completely in pans before removing. Store covered at room temperature until ready to frost and/or serve. Whisk the first three ingredients plus ½ cup of the sugar in a saucepan. Fit pan with a candy thermometer. Meanwhile, beat egg whites on high, preferably with a standing mixer. Once they are frothy and becoming white, add the 2 teaspoons of sugar. Keep beating until thick and opaque. While egg whites are beating, heat saucepan over a medium/high flame, whisking a few times at first. Let boil until thermometer reaches 230 F. With mixer on, quickly pour the hot syrup into the egg whites, and let beat for 6 – 8 minutes, or until the sides of the bowl are at warm room temperature and frosting looks stiff. Cover and chill frosting for up to a few hours, or ice cake immediately. (Note: This icing takes well to a kitchen torch if you like a toasty look and taste.) 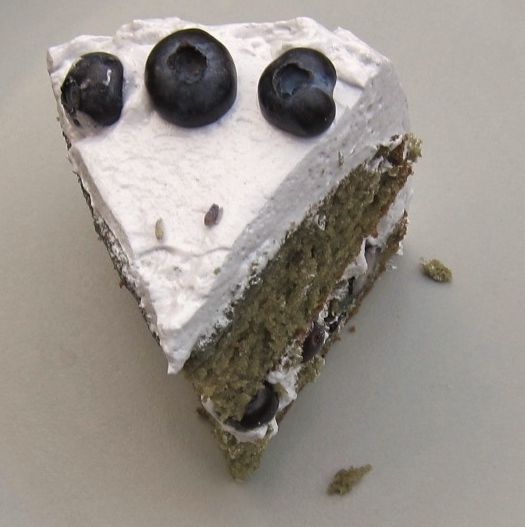 Generously frost the cake layers, layering them with fresh blueberries and a sprinkle of lavender on top, if you wish. Rich with deep color and flavor, lavender blueberry cake is moist, tangy, and a little bit floral with its hint of flowers in every bite. While the outcome of the cake layers is more brown than blue, the stunning batter makes for a beautiful baking process as well as a delicious result. Hidden within the tender crumbs, the poppy seeds add a delectable texture and a crisp, nutty character that really shines (please don’t omit them). Navy, indigo, purple, blue — whatever you call them, these shades belong together on the color wheel and on the tongue, if you ask me. At the least, they are delightful in this dessert. 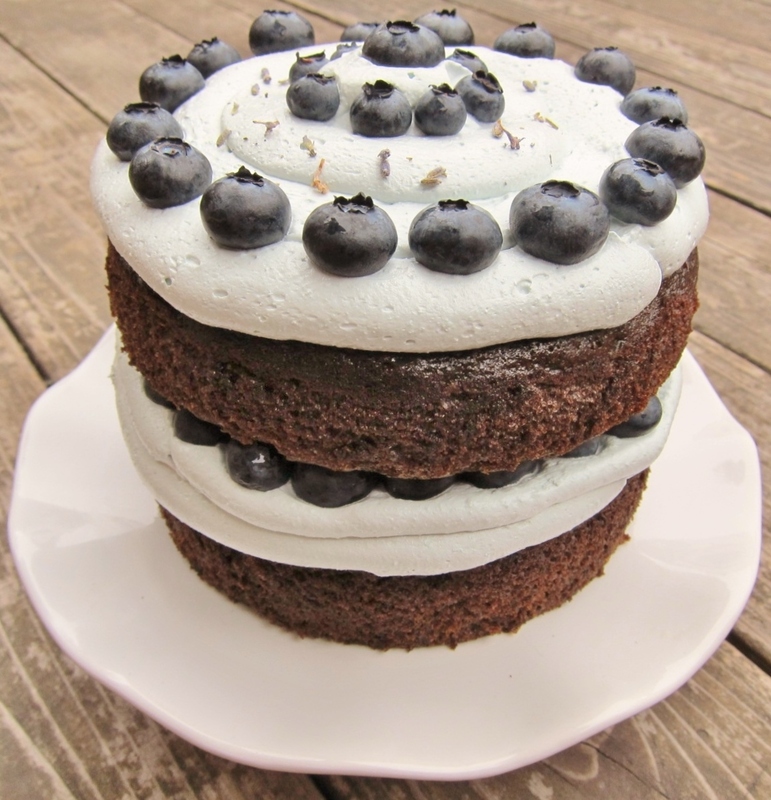 This entry was posted in Baking with Flowers, Cakes & Cupcakes, Sweets, Traditional with a Twist and tagged baking, baking with flowers, baking with lavender, blueberries, blueberry juice, cake, dairy-free, dessert, fresh blueberry, lavender, poppy seed, poppy seeds, poppyseeds, recipe. Bookmark the permalink. Now that sounds so interesting. I love lavender & have been trying for years to get some growing in my yard – no luck so far but I think it’s time to try again. I guess I’ve never thought to use it to cook with but the color is really different & beautiful. Lavender is something I love the idea of but like you am never quite sure about it in practice. It sounds like you have found the right balance. Your cake looks and sounds delicious. Thanks for your kind words!� It’s nice to know we’re on the same page about lavender — and I think the answer has a lot to do with using only a little!� A little hint of it can be really pleasant. This is nothing short of majestic looking. 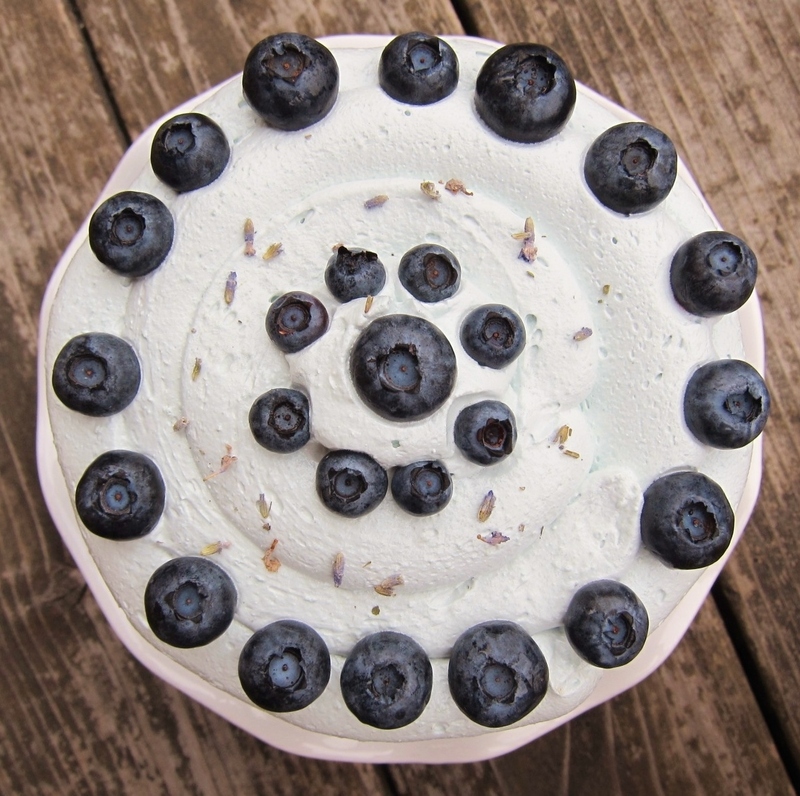 Blueberries are one of my favorite fruits and I’m dying to try this cake–especially since I’ve developed a culinary fear of lavender and its potential to taste like soap. Lavender and honey ice cream is the stuff of dreams, if you’re looking for more lavender foods to make. Your cake looks seriously delicious as well, I’m practically dribbling over my keyboard! 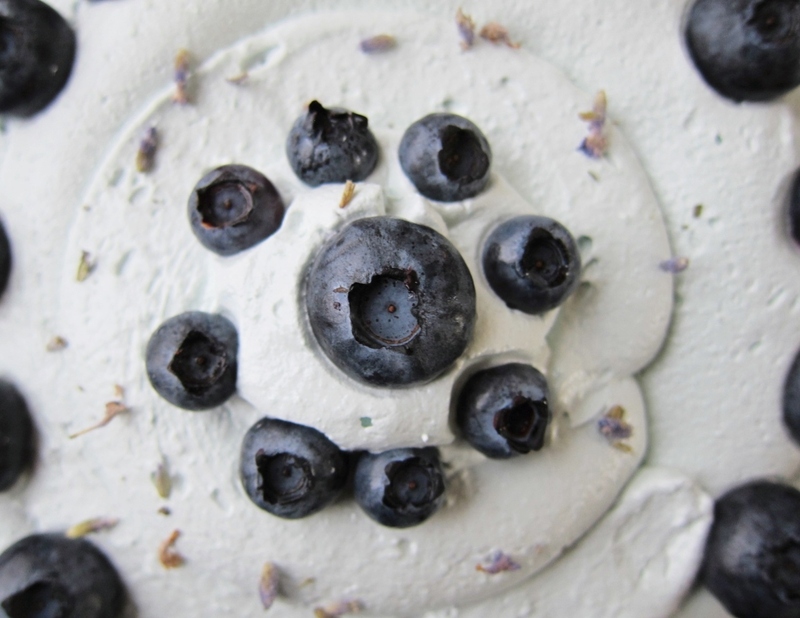 Lavender and honey ice cream sounds incredible!� I would like a big scoop of it on top of this cake.� It makes me happy to know that this cake almost made you drool — thank you for sharing! I am in love with everything about his recipe: the colors, beautiful ingredients, and sweet size of the finished product! As always, your photos are to die for – I could look at them all day! Thank you so much for taking the time to say this, Hannelore!